how the project would unfold. After a donation of scaffolding from a member of the community, the tree was assembled by the entire staff. "I had fun doing this ArtsSmarts project." "This ArtsSmarts project was really fun. We got to work with many different tools and many different fabrics. I think that this will be a nice tree when it is done." "I really liked doing this project. It was so much fun. I love doing paper-mâché. It is so cool. I want to do it again! It was awesome, fun, cool. Wicked, funny, the best. It was the funnest activity of the year. Thank you." The enthusiasm was contagious and some of the teachers continued to explore the medium that they were introduced to with their students. If it inspires, it is successful! "I think that a project like this is fabulous. The children who are taking part will have the honor to talk about this for a long time and always see and remember the great work that was created. It is wonderful because everyone can participate in the creation of a beautiful project." 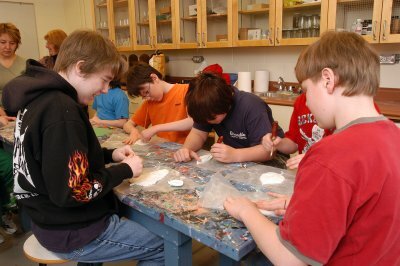 "I feel that any kind of art program/project should be strongly encouraged to inspire students and develop team work." "Excellent program, kids were interested. Creative, original, would be great to do again sometimes."